From deer in Michigan to dairy cows in New Mexico, the wave of perfluoroalkyl substances (PFAS) being identified in groundwater across the United States is affecting more than just drinking water. A New Mexico dairy farmer found this out the hard way when he was informed late last year that seven of this 13 wells were contaminated with PFAS, one of which tested at 12,000 parts per trillion (ppt), or 171 times the United States Environmental Protection Agency (USEPA) health advisory level of 70 ppt, as reported by Searchlight New Mexico. Further testing showed that these chemicals had made their way into his dairy cows and their milk. The farm is located within a PFAS groundwater plume originating from the Cannon Air Force Base in Clovis, New Mexico, which has polluted on-site wells and several off-site wells used for irrigation, dairy, and domestic water supply, according to a New Mexico Environment Department (NMED) fact sheet. Since the 1970s, the Air Force has used a PFAS-containing fire-fighting foam at their properties. This PFAS contamination has been a disaster for farmer Art Schaap, who said he can no longer sell his milk or cows. He is dumping 15,000 gallons of milk a day, has laid off 40 employees, and is planning on euthanizing all 4,000 of his cows. 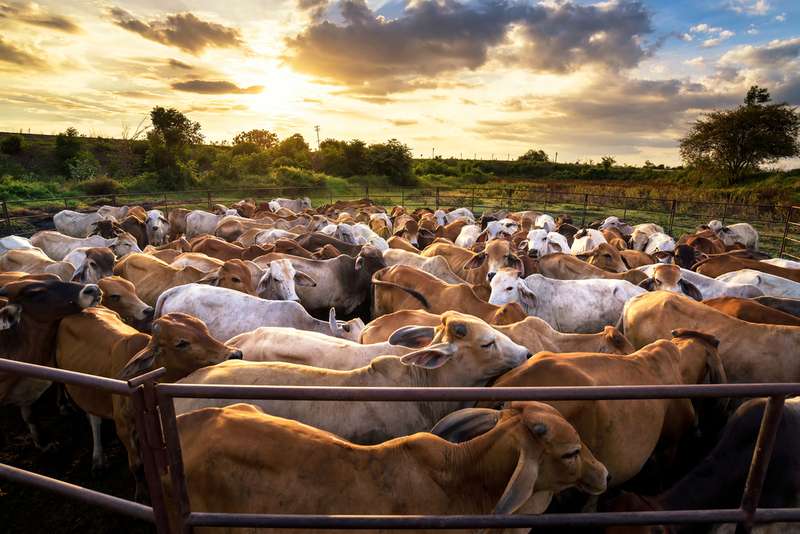 Are livestock and agriculture at risk from PFAS? While the Air Force immediately began providing bottled drinking water to Art Schaap’s family home, no recourse is in sight for damages to his business. PFAS contamination is relatively new to public attention and as “emerging contaminants”, a standard for these chemicals in food and animals hasn't been established in the same way it has for drinking water. Although the USEPA recently announced plans to begin steps to further evaluate the need for enforceable PFAS standards, only a non-enforceable human health advisory level is currently in place. According to the Air Force, the health advisory only applies to drinking water and is not appropriate for use in identifying risk levels for ingestion of food sources, including fish, meat produced from livestock that consumes contaminated water, or crops irrigated with contaminated water. While the impacts to drinking water resources from PFAS are being documented more and more, the indirect impacts to agricultural resources are not as well known. PFAS chemicals can bioaccumulate, making their way from water into crops, livestock and other products. Recent studies in the Journal of Dairy Science and Food Science, have examined the bioaccumulation and transfer of PFAS from contaminated feed and drinking water to cow’s milk and results suggest that certain PFAS compounds have a relatively high potential to transfer to milk and beef from the diet of dairy cows. According to the Centers of Disease Control (CDC), one of the major types of human exposure sources for PFAS is ingestion of contaminated food. However, more research is needed to better understand the risks and to develop safe limits for agricultural resources. What’s New Mexico doing to help? November 30, 2018 - The New Mexico Environment Department (NMED) issued a Notice of Violation (NOV) to the Air Force for failing to take appropriate and timely corrective action regarding known PFAS impacts off-Site of the Cannon Air Force Base. March 5, 2019 – New Mexico filed a complaint in federal district court, asking a judge to compel the Air Force to act on, and fund, cleanup at the base near Clovis and another near Alamogordo. March 6, 2019 – U.S. Senators Tom Udall and Martin Heinrich and U.S. Representative Ben Ray Luján introduced a bill to provide relief to communities and businesses impacted by PFAS contamination in groundwater around Air Force bases in New Mexico and across the country. Curry County, New Mexico is one of the state’s top milk producers, with home to 24 dairies and 66,000 milk cows that annually sell 1.3 billion pounds of milk around the country. Up until late last year, Art Schaap’s dairy was one of these producers. With at least 172 known PFAS contamination sites within the United States alone, including air fields, landfills, and former production facilities, this issue has implications for agriculture and food production across the county. Keep an eye out for more closed farms and spilled milk in the future. Specially curated and developed articles focused on important topics that impact our clients' projects, strategy, and corporate initiatives.